I was never big on the Sunday lunch thing. Never really warmed toward Sunday, so if I’m going to cook big and enjoy it has to be Saturday. And if it’s a snowy, windy Chicago Saturday and I’m not dragging the kids to museums, movies or other assorted activities – roasted chicken it is. Since I discovered how easy it is to roast a whole chicken a few years ago, I haven’t stopped. I’ve marinated chickens with spices, honey, Coke, homemade barbecue sauce, molasses, mustard – you name it, I’ve done it. I’ve done it Greek style with lemons, Thai with coriander and ginger, Italian with olive oil and oregano, Bulgarian stuffed with sauerkraut (yes, it’s not only a German patent) and more. The last thing you can say about roasted chicken is that it’s boring! If I had to give up meat, I think roasted chicken would be the thing I’d truly miss. There are a few requirements for a flavorful, juicy bird. First, it better be fresh, not deep frozen. Second, buy the best you can afford – organic, free range – it really makes a difference. It has less fat, is smaller and much tastier than the monstrous mass-farmed pterodactyls stuffed with more hormones and drugs than a Tour de France cyclist. Third – stuffing soft butter mixed with salt and fresh herbs like sage or thyme under the breast skin will help to eliminate white meat dryness. I don’t use butter on top of the skin as I don’t trust my oven (I suspect the temperature inside is higher than it is supposed to be) and want to avoid burned butter solids on my perfect roasted chicken. I sprinkle it with salt and baste it with olive oil. Lemon or orange juice, honey or red paprika make the skin beautifully golden and crunchy. Sea salt flakes are best for roasting as they dissolve slower and penetrate the meat deeper than regular salt. I always stuff something in the cavity – lemon halves, apples, quartered onion, garlic, fresh herbs – whatever I have or all of the above. They are for flavor, so I don’t bother peeling or coring them. Last Saturday it was time to try a Georgian recipe (the country, not the state) from Nigella Lawson’s “Feast”. Georgia’s cuisine is one of my favorites – the grilled meats, pungent spices, fresh herbs and amazing red wines always fascinated me – not to mention the people’s temperament. Some dream about visiting India or Japan – I dream about Georgia. 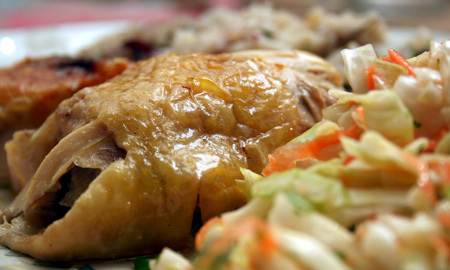 The chicken is stuffed with rice cooked similar to pilaf – with sauteed onions and dry fruits. I didn’t have sour cherries so I used cranberries instead and added chopped fresh mint to the required parsley. I did alter the recipe a little. I doubled the amount of rice as it sounded so good and the chicken was only 2 ½ pounds (around 2 kg), able to hold only about two cups of the cooked stuffing. I also took the liberty of chopping the liver and heart in to the rice – I don’t believe that any Georgian cook would throw those out. A simple cabbage and carrot salad and chocolate cake rounded out the Saturday lunch. There were five of us and I still had chicken leftovers for school lunch. Wash and pat dry the chicken and place it in the fridge without cover until the rice is ready. For the stuffing, melt the butter and chicken fat in a pot, add the onion and garlic and saute over medium heat until soft, 10-15 minutes. Add the dry fruit and rice (and chopped liver and heart if using) and mix well until the grains are glisten from the fat. Pour the water, add salt and cover the pot. Turn down the heat to a simmer and cook for about 15 minutes or until all the water is absorbed. Try for seasoning, add salt if needed. Add freshly ground black pepper and the chopped herbs and mix with a fork. Stuff as much rice as possible in the cavity and secure the opening with cocktail sticks. Mix the soft butter with ¼ tsp salt and massage between the breasts and the skin. To do that place the chicken with the cavity opening towards you, push your fingers lightly between the skin and the breast, being careful not to tear the skin. When you separate those, take some of the butter and slide it under the skin. Repeat until all the butter is gone. Salt the chicken generously, baste it with the olive oil all over and, if you wish, sprinkle with red paprika. Place breasts up in a roasting pan just big enough to hold the chicken. The oven rack should be positioned in the middle. Roast for 1½ hour. Check by piercing the space between the leg and the body. If the juices run clear the bird is done. The skin is crispy and golden, the stuffing is absolutely delicious and nobody will ever tell you that roasted chicken is boring. This entry was posted on Monday, February 8th, 2010 at 7:44 am	and is filed under Mains, Recipes. You can follow any responses to this entry through the RSS 2.0 feed. You can leave a response, or trackback from your own site.